Ghost Knives is a manufacturer of high quality semi-custom knives. Their knives are 100% made in the USA, including source materials. Their designs tend towards the elegant, lightweight, and functional by providing only what features are necessary. They use only high quality materials and strive to keep value high by keeping price low. 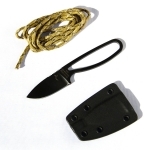 Below is a chart showing the best Ghost Knives knives on the site as reviewed by multiple users. Keep in mind that there are many great Ghost Knives knives out there, but if you can't decide on one after searching the site, choose one off this list and we are confident that you will be happy!